Stir the yeast into the warm water and then mix thoroughly with half the flour. Cover with clingfilm and leave to rise for 1 hour, until the wet dough nearly doubles in size. Work in the rest of the flour, with the salt and sugar. Knead for 5 minutes. You should end up with an elastic, soft dough. If it is too dry, add a tablespoon of water - and if too wet, work a little more flour into it. Put the dough into a bowl, cover with clingfilm, and set aside in a warm place for 1-2 hours until doubled in size. Knock the air out of the dough and cut into 8 pieces. Preheat the oven to 220°C/gas mark 7. Oil 2 baking sheets and put in the oven to heat. On a floured surface, roll out each piece of dough as thinly as possible to acircle measuring about 20cm. Place 2 on each preheated baking sheet (you'll need to bake the pizzas in 2 batches). Press the circles out as thinly as you can with your fingers. 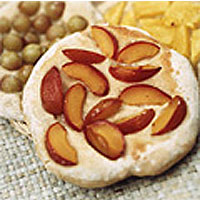 Arrange slices of fruit in the centre of the dough. Scatter each with 1 tbsp sugar. Leave to prove for 15-30 minutes, then bake in the oven until the dough is crisp and the fruit slightly caramelised. Repeat with the second batch. Serve immediately, with more sugar sprinkled on top.